Vinyl siding is one of the most popular exterior finishing options for new homes and remodels. It is durable, versatile, and resilient, but it does require some upkeep. Here are a few ways to extend the lifespan of your home’s vinyl siding. Keep shrubs and trees away from the perimeter of the house. Although vinyl siding doesn’t rot or wear in the same way as wood, it can crack or puncture. Keep shrubs and trees away from the perimeter of the house so they don’t mar the material. Keep grills or other flames at least two-three feet from the siding. Vinyl siding is resilient, but it isn’t fireproof. Because it can melt at high temperatures, be sure to keep any grills, firepits, or any other open flames at least two to three feet from the side of the house. Heavy winds can pull vinyl siding off of a house, so be sure it is firmly attached. After a heavy storm, inspect the house to make sure everything is still intact. If you find that a plank of siding has been blown off or otherwise damaged, replace it as soon as possible. When inspecting vinyl siding, look for cracks or breaks. Be careful where you park your bicycles or lawn mower, so you don’t accidentally puncture the siding. If you do see that a plank of siding has been broken, replace it. Clean vinyl siding once a year. 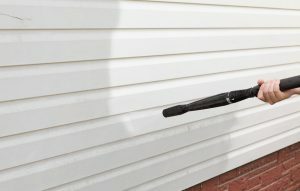 Like any exterior product, vinyl siding can accumulate dirt, grime, and stains due to things like pollen, grass clippings, bird and insect droppings, and spider webs. Vinyl siding that is in shady, moist areas can also be vulnerable to mold and mildew. Cleaning vinyl siding is fairly straight-forward but should be done about once a year to keep it properly maintained. To clean your vinyl siding, you’ll need a hose, a stiff-bristled brush, a bucket, and a mild detergent such as laundry soap or a TSP substitute. To prevent streaking, start at the bottom and work your way up to the top of the house. After scrubbing the surface, rinse it with clear water. You can also use a pressure washer to clean vinyl siding, but be extra careful if this is the route you choose. Hold the hose at eye level to avoid spraying water underneath the siding panels. When you clean your siding, you may want to cover plants and brickwork areas with a tarp. This protects them from any runoff of detergents or products you use to clean the siding. Most siding manufacturers offer warranties of 20-40 years, but vinyl siding can last a lifetime if cared for properly. Whether you need someone to install siding on a new home or are remodeling your current home, the professionals at E3 can guide you through the process. Give us a call, connect with us on Facebook, or submit this online contact form to see how we can help you!